iOS Safari keeps track of frequently visited webpages, offering quick links to those pages and sites on the initial startup and new tabs in the browser. For the less familiar, the Frequently Visited section is underneath Safari Favorites in iOS, and it updates itself as you browse the web and access particular pages on an iPhone, iPad, and iPod touch. While many users may like the Frequently Visited section and find it helpful, you may discover a web page or link under this list that you’d rather not be there, and in such a case, you’d probably want to delete the frequently visited page from this list in Safari. Note that removed pages will appear again if you visit them again frequently, so even if you delete a page but continue to go visit that site again after the fact, it will show up again. You can then either remove it again, disable the feature, or use Private Browsing mode in Safari in the future to prevent the sites from appearing in the Frequently Visited lists again in the future. 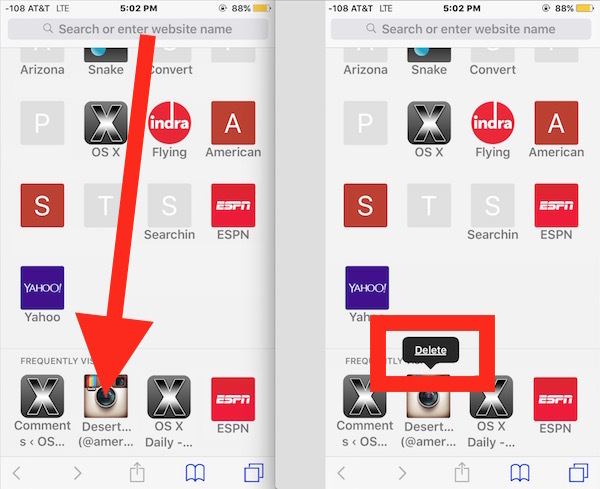 Remember you can also clear recent browsing history in Safari on iOS, or go all out and delete all cookies, history, caches, and web data from the iOS browser. Sorry, I can neither open a new Tab nor find Safari Favorites. I do not know how to do either on my iPhone 6. You have lost me completely. Please go to Settings –> Safari which is where you can address the aforementioned issues. I was unable to understand the instrux as well. Guys – the same happened to me; however you need to turn your iPhone into horisontal view instead of vertical view, then the + sign appears in the top section. Press the + and then the Frequently Visited pages appears further down. 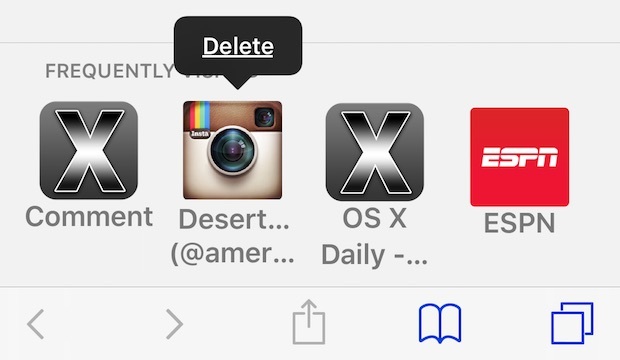 I would like to alphabetize my Bookmarks in Safari. That option does not seem to be available, though it is easy to accomplish in Microsoft. Can anyone advise how to alphabetize Bookmarks in Safari, I would be most grateful. This is a different topic, but press the open-book icon next to the tabs icon (see discussion above; it’s to the left of the ESPN icon) Then select the left-most tab (again, the open book) on that screen. You can from here organize the folders shown, or select a folder to see its contents and organize those. You can turn off Frequently Visited sites in settings, but you turn them ALL off. The author intended you to be able to selectively pair the list down. To see your Tabs, you need to first display them by clicking on the double-squares icon, you can see it in the pictures above below the ESPN icon. If you don’t see these, swipe up or down until you do. Once in the stacked “Tabs” view, at the bottom you’ll see a “+” which will give you a new Tab. Then scroll/swipe down to see the Frequently Visited and follow the instructions above. It doesn’t matter if you’re in horizontal or vertical, the “+” will be plainly there. I cannot delete any frequently visited icons. I’ve read all the instructions and it doesn’t work. I have no icon or tab. Can I get detailed instructions? I choose to delete them all and pick my favorites myself. Please help. Only worked partially. When you go into advanced section all the webpages show up, but it shows no gigs used….when you swipe to the left a delete shows up and when that is used it goes away …then you exit , go back in and the site name is still there…also the same when you use the edit button and get the red circle with the negative sign in it…..it never deletes permantly whether you re visit site or not…..any ideas? ?